Award-winning publisher Archaia, an imprint of BOOM! 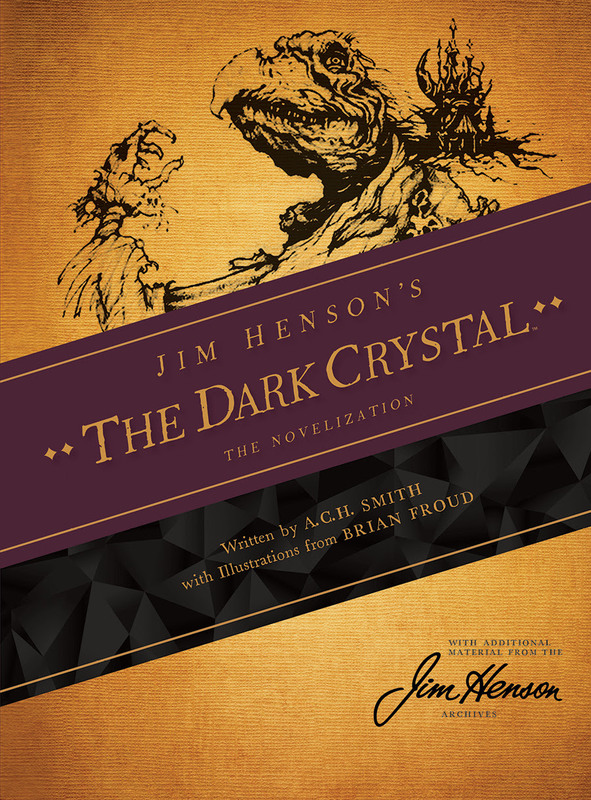 Studios, is excited to announce the June debut of JIM HENSON’S THE DARK CRYSTAL: THE NOVELIZATION, the second in a planned series of three hardcovers that reprint the prose novel adaptations of fan-favorite Henson properties. The book follows the recent April release of JIM HENSON’S LABYRINTH: THE NOVELIZATION and will be followed by the August release of JIM HENSON’S STORYTELLER: THE NOVELIZATION. JIM HENSON’S THE DARK CRYSTAL: THE NOVELIZATION, written by author and playwright A.C.H. Smith and overseen by Jim Henson, reprints the long-out-of-print prose novel of the classic 1982 fantasy film for the first time in hardcover and features illustrations and concept designs by legendary illustrator and concept artist Brian Froud (The Goblins of Labyrinth, Faeries) that have never before been published. The book also contains an exclusive peek into Jim Henson’s creative process with a transcription of over 20 never-before-seen pages of his detailed notes on an early draft of the adaptation. The Jim Henson Company has remained an established leader in family entertainment for over 50 years and is recognized worldwide as an innovator in puppetry, animatronics and digital animation. Best known as creators of the world famous Muppets, Henson has received over 50 Emmy Awards and nine Grammy Awards. Recent credits include the Emmy® nominated Sid the Science Kid, Dinosaur Train, and Pajanimals as well as the new series Doozers, a CG animated preschool series. Features include the upcoming Alexander and the Terrible, Horrible, No Good Very Bad Day, The Dark Crystal, Labyrinth and MirrorMask. Television productions include Fraggle Rock, the sci-fi cult series Farscape, and the new reality competition Jim Henson’s Creature Shop Challenge. With additional locations in New York and London, The Jim Henson Company is headquartered in Los Angeles on the historic Charlie Chaplin lot, complete with soundstage and postproduction facilities, the Company is also home to Jim Henson’s Creature Shop™, a pre-eminent character-building and visual effects group with international film, television, theme park and advertising clients, as well as Henson Recording Studios, one of the music industry’s top recording facilities known for its world-class blend of state-of-the-art and vintage equipment. The Company’s Henson Alternative brand is currently touring “Puppet-Up! – Uncensored,” a live puppet improvisational show. Next The Batmobile and Batman Revealed: What Do You Think?